Sounding balloon launch from Esrange Space Center, Kiruna. Credits: Thomas Kuhn. Clouds and particularly ice clouds are important agents of climate whose physical dynamics are unknown in a good measure due to the difficulty of its study. In order to improve the analytical capacity of remote sensing methods (e.g. 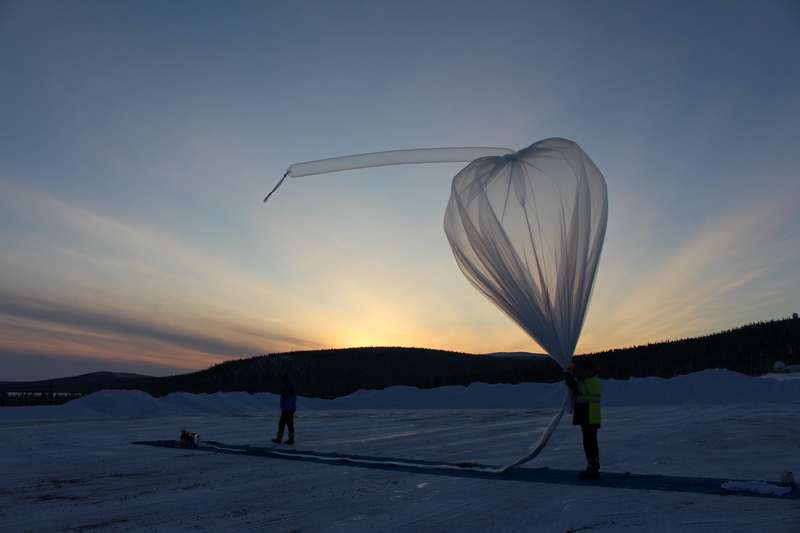 LIDAR – Light Detection and Ranging), and to improve the reliability of retrieval processes applied to data collected from them, the Group of Atmospheric Science performs in situ ice cloud measurements by means of sounding balloons launched from Esrange Space Center, Kiruna. The analysis of the samples gathered and the images obtained provides parameters that are useful for the refinement of radiative transfer models, offer an experimental reference for validating remote sensing measurements, and contribute direct knowledge of ice clouds microphysics.